A Spanish newspaper has reported that Birmingham City are trying to offload Serbian striker Nikola Zigic to Barcelona’s Espanyol. Blues are keen to get big earning Zigic off their payroll and have offered the 6ft 7in forward to the Catalan club until the end of the season. Former manager Alex McLeish paid £6million for the Serbian international when he arrived from Valencia during the summer of 2010. It is understood that Birmingham are looking to make room in their squad for Ajax striker Mounir El Hamdaoui, who they are holding talks with. 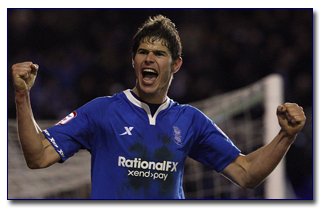 31 year-old Zigic has made 60 appearances for Blues, scoring 12 goals. This entry was posted in BCFC News and tagged bcfc, birmingham city, birmingham city football club, espanyol, nikola zigic. Bookmark the permalink.